Toyota’s Gemba Walk has inspired millions of businesses globally. If you’re also intrigued to taste the benefits of Gemba walk do find a reputed developer that has designed and impressed the business world with an excellent software management system for the walk. It’s no rocket science but yes, of course, you need some relevant ideas to stop by a smart developer showcasing a high-end software technology for the simplifying your Gemba walk. Wear a stringent mask while short-listing the developers. Go through an aggressive research for selecting the few developers tasted success for designing useful Gemba walk software. Besides, know about the developers, their achievements and that clients are using the software along with the success scores. Understanding and knowing the features of the Gemba walk software is extremely necessary. From the websites, you can get the product description in details featuring all the qualities and features the software has. You should also check whether it’s mobile-friendly so that during the walk, you can use the product on your tablet or smartphone and access all the features while monitoring. 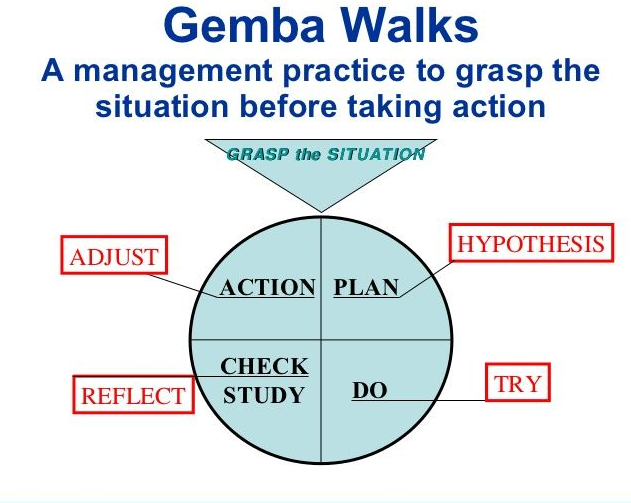 You should be well aware of the design of the Gemba walk management software. Check whether it is built with all the features and efficiency matching your business model. Otherwise, chances will remain to overlook significant sections that demand proper improvement. The interface should be under-friendly and anyone can easily learn using the system shortly. Avoid the Gemba walk software systems with a complex interface and limited features. Ease of usability will make the whole process smoother and effective. Check whether the system has a proper backup. This is necessary to keep a tab on the past walks that you may need to cross refer for strategizing the future Gemba Walks. You must be impressed by the reviews posted by the present or previous users. Check the feedback or the ratings they have received. The reviews showcase the usability of the Gemba walk software and how the users are actually benefited for improving their business by investing on the system. You should be concerned about the ROI being an investor. Check whether you’re buying it at a competitive rate. For that, don’t forget to research and compare the rates before investing the Gemba walk software management system.